132 YOTEI 42°49'47"N/ 140°48'54"E 0805-032 Stratovolcanoes T* YOTEI ..
meanwhile (until 11: 41 UTC) -14 afterquakes with magnitudes between 6.0 and 7.2 followed! TSUNAMI WARNING ISSUED FOR THE ENTIRE PACIFIC OCEAN! ABOUT SUWANOSE-JIMA ( geological summary by USGS- global volcanism program/ Smithsonian institute: The 8-km-long, spindle-shaped island of Suwanose-jima in the northern Ryukyu Islands consists of an andesitic stratovolcano with two historically active summit craters. Only about 50 persons live on the sparsely populated island. The summit of the volcano is truncated by a large breached crater extending to the sea on the east flank that was formed by edifice collapse. Suwanose-jima, one of Japan's most frequently active volcanoes, was in a state of intermittent Strombolian activity from On-take, the NE summit crater, that began in 1949 and lasted nearly a half century. The largest historical eruption took place in 1813-14, when thick scoria deposits blanketed residential areas, after which the island was uninhabited for about 70 years. The SW crater produced lava flows that reached the western coast in 1813, and lava flows reached the eastern coast of the island in 1884. 2013 DEC- 26 FEB 25? 2013 NOV 27 DEC- 03? Based on information from JMA, the Tokyo VAAC reported that an explosion from Suwanose-jima on 27 November generated a plume that rose to an altitude of 1.8 km (6,000 ft) a.s.l. and drifted E.
2013 OCT- 21 OCT- 22? 2013 AUG- 21 SEP- 17? 2012 OCT- 03 OCT- 12? 2012 MAR- 06 MAR- 07? Based on information from JMA, the Tokyo VAAC reported an explosion from Suwanose-jima on 6 March. Details of a possible resulting plume were not reported. 2012 FEB- 06 FEB- 07? 2012 JAN- 12 JAN- 17? Based on information from JMA, the Tokyo VAAC reported an explosion from Suwanose-jima on 12 January. Details of a possible resulting plume were not reported. 2011 Oct- 14 Oct- 25? Based on a pilot observation, the Tokyo VAAC reported that on 14 October an ash plume from Suwanose-jima rose to an altitude of 1.2 km (4,000 ft) a.s.l. and drifted SE. Ash was not detected in satellite imagery. 2011 SEp- 12 Sep- 13? 2011 JULY- 14 JULY 19? ABOUT ASO ( geological summary by USGS- global volcanism program/ Smithsonian institute: The 24-km-wide Aso caldera was formed during four major explosive eruptions from 300,000 to 80,000 years ago. These produced voluminous pyroclastic flows that covered much of Kyushu. A group of 17 central cones was constructed in the middle of the caldera, one of which, Naka-dake, is one of Japan's most active volcanoes. It was the location of Japan's first documented historical eruption in 553 AD. The Naka-dake complex has remained active throughout the Holocene. Several other cones have been active during the Holocene, including the Kometsuka scoria cone as recently as about 210 AD. Historical eruptions have largely consisted of basaltic to basaltic-andesite ash emission with periodic Strombolian and phreatomagmatic activity. The summit crater of Naka-dake is accessible by toll road and cable car, and is one of Kyushu's most popular tourist destinations. JMA reported that a very small explosion from Asosan's Nakadake Crater occurred on 19 February. An off-white plume rose 200 m above the crater rim and drifted SW. During fieldwork on 21 February volcanologists noted that sulfur dioxide emissions remained high. The Alert Level remained at 2 (on a scale of 1-5). 2013 DEC- 22 MAR 04? On 27 December 2013 JMA raised the Alert Level for Aso to 2 (on a scale of 1-5) because volcanic tremor amplitude had been increasing since 20 December. However, on 2 January 2014 the amplitude rapidly decreased. Sulfur dioxide emissions were 1,200 tons per day during 2-9 January and 1,500 tons on 10 January. Volcanic tremor amplitude increased between 0800 and 1900 on 12 January. At 1215 on 13 January a very small eruption from Naka-dake Crater generated a grayish white plume that rose 600 m and drifted S, producing ashfall downwind. 2011 MAY- 15 JAN- 15? Based on pilot observations, the Tokyo VAAC reported that on 15 May an ash plume from Aso rose to an altitude of 2.1 km (7,000 ft) a.s.l. and drifted NE. JMA reported that the next day plumes rose to altitudes of 1.8-2.1 km (6,000-7,000 ft) a.s.l. A pilot noted that an ash plume rose to an altitude of 2.4 km (8,000 ft) a.s.l. and drifted N that same day. During 17-18 May the JMA reported that ash plumes rose to an altitude of 1.8 km (6,000 ft) a.s.l. and drifted E and SE. ABOUT IOTO [IWO-JIMA] ( Geological summary by global volcanism program- USGS/ Smithsonian institute):Ioto (also known as Iwo-jima) in the central Volcano Islands portion of the Izu-Marianas arc lies within a 9-km-wide submarine caldera. Ioto, Iwo-jima, and Io-jima are among many transliterations of the name, which means "Sulfur Island;" the volcano is also known as Ogasawara Io-jima to distinguish it from several other "Sulfur Island" volcanoes in Japan. The triangular, low-elevation, 8-km-long island narrows toward its SW tip and has produced trachyandesitic and trachytic rocks that are more alkalic than those of other Izu-Marianas arc volcanoes. The island has undergone dramatic uplift for at least the past 700 years accompanying resurgent doming of the caldera. A shoreline landed upon by Captain Cook's surveying crew in 1779 is now 40 m above sea level. The Moto-yama plateau on the NE half of the island consists of submarine tuffs overlain by coral deposits and forms the island's high point. Many fumaroles are oriented along a NE-SW zone cutting through Moto-yama. Numerous historical phreatic eruptions, many from vents on the west and NW sides of the island, have accompanied the remarkable uplift. 2012 MAY- 02 MAY.- 01? ABOUT GROZNYY GROUP ( Geological summary by global volcanism program- USGS/ Smithsonian institute): The Grozny volcano group in central Iturup Island contains the complex volcanoes of Ivan Grozny and Tebenkov. The former has a 3-3.5 km diameter caldera that is open to the south, where the large, 1158-m-high andesitic Grozny extrusion dome (also known as Etorofu-Yake-yama) was emplaced. Several other lava domes of Holocene age were constructed to the NE; extrusion of these domes has constricted a former lake in the northern side of the caldera to an extremely sinuous shoreline. The forested andesitic Tebenkov volcano, also known as Odamoi-san, lies immediately to the NE of the Grozny dome complex. The large Machekh crater, which displays strong fumarolic activity, lies immediately south of Tebenkov. Historical eruptions, the first of which took place in 1968, have been restricted to Ivan Grozny. 2013 MAR- 30 APR- 09? 2013 FEB- 16 FEB- 19? 2012 AUG- 21 Sep- 18? The Ivan Groznyy (“Ivan the Terrible”) volcano erupted early on Thursday morning on the island of Iturup, part of the Kuril group in Russia's Far East. The volcano spewed a column of ash onto the surrounding area. Local people in the nearest towns, Goryachiye Klyuchi (9 kilometers away) and the city of Kurilsk (25 kilometers), noticed a faint smell of hydrogen sulfide gas, which disappeared later. The eruption poses no threat to nearby human settlements. 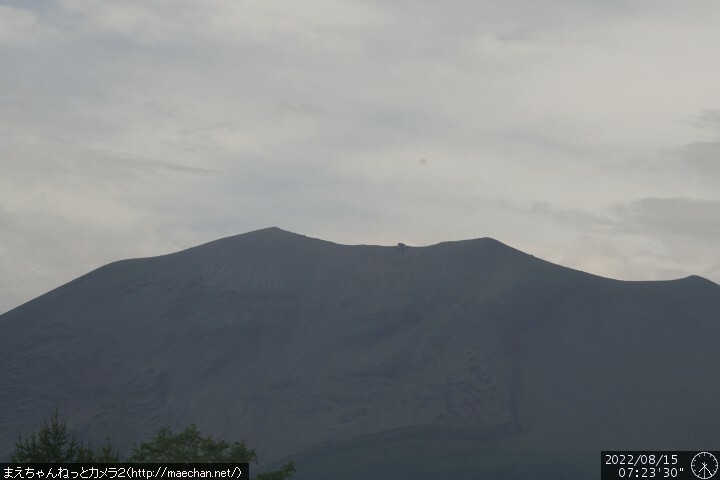 Scientists recorded signs of the impending eruption on Wednesday, when gas emissions on the volcano’s northeast slope increased, a Sakhalin region Emergency Ministry representative told RIA Novosti. Observation of the volcano continues. ABOUT ALAID ( geological summary by USGS- global volcanism program/ Smithsonian institute:Geologic Summary. The highest and northernmost volcano of the Kurile Islands, 2,339-m-high Alaid is a symmetrical stratovolcano when viewed from the N, but has a 1.5-km-wide summit crater that is breached widely to the S. Alaid is the northernmost of a chain of volcanoes constructed W of the main Kuril archipelago and rises 3,000 m from the floor of the Sea of Okhotsk. Numerous pyroclastic cones dot the lower flanks of Alaid, particularly on the NW and SE sides, including an offshore cone formed during the 1933-34 eruption. Strong explosive eruptions have occurred from the summit crater beginning in the 18th century. Reports of eruptions in 1770, 1789, 1821, 1829, 1843, 1848, and 1858 were considered incorrect by Gorshkov (1970). Explosive eruptions in 1790 and 1981 were among the largest in the Kurile Islands. 2012 OCT- 07 OCT- 23? About RASSHUA- Geological summary by Smithsonian inst/USGS - global volcanism program:The elongated 6 x 13 km island of Rasshua in the central Kuriles contains three overlapping central cones within a 6 km caldera whose eastern margin is beyond the shoreline. An eroded central cone was constructed during the late Pleistocene, along with an isolated cone near the NW coast. Two Holocene cones were built within the crater of the central cone. The westernmost forms the 956 m high point of the island and is the source of lava flows that flooded the crater floor and descended to the coast. The easternmost cone, active during historical time, is truncated by a 500-m-wide crater that is breached to the SE. This crater may have formed during a violent eruption in 1846. The only other known historical eruption produced weak explosions in 1957. Fumarolic activity continues in the eastern crater and in the saddle between the two summit cones. CHIRINKOTAN Geological summary by Smithsonian inst/USGS - The small, mostly unvegetated 3-km-wide island of Chirinkotan occupies the far end of an E-W-trending volcanic chain that extends nearly 50 km west of the central part of the main Kuril Islands arc. Chirinkotan is the emergent summit of a volcano that rises 3000 m from the floor of the Kuril Basin. A small 1-km-wide caldera about 300-400 m deep is open to the SE. Lava flows from a cone within the breached crater reached the north shore of the island. Historical eruptions have been recorded at Chirinkotan since the 18th century. Fresh lava flows also descended the SE flank of Chirinkotan during an eruption in the 1880s that was observed by the English fur trader Captain Snow. 2013 SEP 01 SEP- 04? 2013 JULY 09 AUG- 20? 2013 MAY- 24 MAY- 29? ABOUT NISHINO-SHIMA ( Geological summary by global volcanism program- USGS/ Smithsonian institute):The small island of Nishino-shima was recently enlarged when it was joined to several new islands that formed during an eruption in 1973-74. Water discoloration has been observed on several occasions since. The 700-m-wide island is the summit of a massive submarine volcano that has prominent satellitic peaks to the south, west, and NE. The summit of the southern cone rises to within 214 m of the sea surface 9 km SSE of Nishino-shima. 2013 NOV- 20 JAN- 07- 2014? ABOUT KIRISHIMA ( Geological summary by global volcanism program- USGS/ Smithsonian institute):Kirishima is a large group of more than 20 Quaternary volcanoes located north of Kagoshima Bay. The late-Pleistocene to Holocene volcano group consists of stratovolcanoes, pyroclastic cones, maars, and underlying shield volcanoes located over an area of 20 x 30 km. The larger stratovolcanoes are scattered throughout the field, with the centrally located, 1,700-m-high Karakuni-dake being the highest. Onami-ike and Mi-ike, the two largest maars, are located SW of Karakuni-dake and at its far eastern end, respectively. Holocene eruptions have been concentrated along an E-W line of vents from Mi-ike to Ohachi, and at Shinmoe-dake to the NE. Frequent small-to-moderate explosive eruptions have been recorded since the 8th century. 2011 AUG- 06 Aug 09? 2011 JUNE- 23 JULY- 05? 2011 APRIL- 18 April 21? According to the Earthquake Research Institute, an explosion on 26 January from Shinmoe-dake (Shinmoe peak), a stratovolcano of the Kirishima volcano group, prompted JMA to raise the Alert Level to 3 (on a scale of 1-5). Lightning in the ash plume was visible in video footage that same day. Based on reports from JMA, analyses of satellite imagery, and pilot observations, the Tokyo VAAC reported that during 26-27 January ash plumes rose to altitudes of 1.8-2.1 km (6,000-7,000 ft) a.s.l. and drifted SE. According to news articles, tephra fell as far away as 8 km on 27 January and disrupted airline and train services. Some people in Miyazaki (55 km E) voluntarily evacuated and approximately 30 people in Takaharu (15 km E) spent the night in an evacuation center. Video footage showed people clearing ash from the streets. During an overflight on 29 January, scientists observed a new lava dome in the crater, about 50 m in diameter and incandescent in some areas. They also observed that the crater lake was gone and pyroclastic-flow deposits, 500-600 m long, were present in the SW crater. Notices issued from the Tokyo VAAC during 28-30 January stated that ash emissions were continuing. On 31 January, an ash plume rose to an altitude of 2.1 km (7,000 ft) a.s.l. and drifted SE. A news article noted that an explosion on 1 February was heard more than 7 km away, and broke glass in buildings and cars as far as 8 km away. On March 11- 2011 , reportedly Japan`s automatic Earthquake detection system triggered and automatic shutdown process in several nuclear power plants along the coast of Honshu, after a 9.0 magnitude Earthquake had occured offshore Honshu at 05:46:23 UTC ( 14:46:23 Uhr local time) . It was not reported, whether the Onagawa_Nuclear_Power_Plant als was shut down by that automatic, but its position close to the epicenter would assume, it would have been shutdown. The other explanation why any fire broke out soon after the earthquake had happened, would be that it was kept online as the power plant which supplies other nuclear plants with electricity.The fire was reported, shortly before the Tsunami hit the island. It was reported, that the tranformer building cought fire what is typical for an so called overvoltage after a Sun SME or here: if or 3 line shortcut has occured, here most likely caused by the Earthquake itself or when the Tsunami wave hit the power grid. The nuclear power complex of Fukushima in 177 km ( 109 miles) distance from the offshore epicenter consists out of 6 reactor blocks with 1 elder 360 MW boiling water reactor built by General Electrics in 1971 and 5 other 720 MW boiling water Reactors built later by Japans Toshiba. When the Earthquake occured, 3 reactor were online. Reactor Nr 4 whad been emptied due to a revision. which had just been completed before by German engineers The 90- 100 tons fuel element had been stored along with elder spent fuel rods in the reactors spent fuel rod storage pool, most unfortunataly built in a store above the reactor block. Reportedly this nuclear fuel rods were not yet inserted back into the reactor core when the incident began. Most scientist agree that it needs in a usual 1400 or 1600 MW Reactor as in Germanyto doll the reactor core at least 6 hours after shutdown . After this 6 hours they say- the "after decay heat" would have sunk below uncritical temperatures and values those cannot cause a meltdown or serious damage to the fuekl and control rods. In this time the temperature also would not rise but steady drop...The first ive reports however reported for hours that the batteries were still working . they worked for hours most probably until the next day ( when Reactor 1 exploded) . Also as each reactor in Fukushima has only the half capacity and therefor also half fuel content than any German reactor the decay heat would be lower and the unciritical temperature might or must(?) therefor have been achieved earlier. So most likely the subsequent cause of the incident was not caused by the " Isotope after decay heat" but by an uncompleted shutdown process. With the control rods not driven in completely the nuclear fission in the uppper partsof the fuel rod installation( where the nuclear fission between the fuel rods was therefore not interrupted by the neutron absorber) continued. If all the cooling systems failed, these upper portion in the reactors fuel rods started to overheat and melted most likely just 90 minutes e later . The latest report of the Japonese government in May 2011 confirmed that the partial meltdown indeed began soon after the quake and the failed shutdown already on March 11 ( what supports my thesis) The melt dropped down inside the reactor and has damaged- at least deformed other portions where the control rods where in place and prevented the neutron flow. . If deformed leaks resp gaps between the control rods and the nuclear fuel rods would cause the nuclear fission to start again within these damaged spots, A ll what has been reported since then ( the radiation send by the reactor rose exponential from 300 Microsievert in the first week after to 4- 5 millisievert in th second to 100 Millisievert one week later . Latest reports of June 2011 reported another rise to 4 Sievert near to reactor 1 . 1 rem = 0,01 Sv = 10 mSv.which is equivalent to ( 4 Sievert are 400 REM - roentgen equivalence measures- equal to 400 default röntgen machines which permenently work sent our radiation) . Thiss lets conclude that the overheated spots in the reactor cores widen and the small nuclear fissioon fire spreads slowly by and byto the other still intact fuel and control rod parts in the reactor cores ONly estimated 10 percent havwe meleted yet the other 90 is still in side the reactor cores will therefor inavertibly lead to a final catastrophy with a huge emission of radioactive isotops still to come if not more measurements are taken than right now. At least the entire plant w shoud be secured and surrounded with a mmassive wall of iron construction elements concrete stones and so on so far that the entire plant can be set under water . Such a basin might be sufficiant to cool all reactors over one ore massive steel ship in the sea the cooling water is lead through either directly or by an heat exchanger system placed inside the huge pool. TEPCO the Japonese emergency management decided now permenently to lead seawater through all 3 damaged reactor blocks to prev ent the total meltdown. Due to highest radiation levels, operation shad to be repeatedly interrupted. Another problem made the spent fuel storage pools which contains each another hundred tons of spent fuel rods. Due to earlier prescription made by IAEA, these pools have to be connected to the reactors emergency cooling systems ( supression pool" below the reactor cores. ) , The heat from the bursted reactors now started to heat up this pools. Adsitional spraying machines had to be deployed to doll these pools from outside the bursted reactor buildings. Though the cooling capabilities could halfway sufficiantly cool the overheating reactors new complications took place : Due to the leaks in the reactor the water pumped through rose up in the building causing damages and leaks there and may finally cause outside walls to burst. After all, TEPCO and the operation teams is not much further than on the first day. The water in the building was recently pumped into tanks and onto a ship , where it is partially decontaminated and c leaned form the salt to be pumped back through the reactors again . By this, TEPCO wants to install a permanent cooling system necessary to cool all 4 reactors at least for one year or more, until the activity has dropped so far that the reactor cores get accessible and the nuclear material can be removed. CHIRPOI- Geological summary by Smithsonian inst/USGS - global volcanism program:Chirpoi, a small island lying between the larger islands of Simushir and Urup, contains a half dozen volcanic edifices constructed within an 8-9 km wide, partially submerged caldera. The southern rim of the caldera is exposed on nearby Brat Chirpoev Island. Two volcanoes on Chirpoi Island have been historically active. The symmetrical Cherny volcano, which forms the 691 m high point of the island, erupted twice during the 18th and 19th centuries. The youngest volcano, Snow, originated between 1770 and 1810. It is composed almost entirely of lava flows, many of which have reached the sea on the southern coast. No historical eruptions are known from 742-m-high Brat Chirpoev, but its youthful morphology suggests recent strombolian activity. 2013 OCT- 22 DEC 17? 2013 AUG- 05 SEP- 04? 2013 JULY- 14 JULY- 16? 2013 JAN- 29 MAR- 19? About MEDVEZHIA- Geological summary by Smithsonian inst/USGS - global volcanism program:The Medvezhia volcanic complex occupies the NE end of Iturup Island. Two overlapping calderas, 14 x 18 and 10 x 12 km in diameter, were formed during the Pleistocene. The caldera floor contains several lava domes, cinder cones and associated lava fields, and a small lake. Four small closely spaced stratovolcanoes were constructed along an E-W line on the eastern side of the complex. The easternmost and highest, Medvezhii, lies outside the western caldera, along the Pacific coast. Srednii, Tukap, and Kudriavy volcanoes lie immediately to the west. Historically active Kudriavy (also known as Moyoro-dake) is younger than 2000 years; it and Tukap remain fumarolically active. The westernmost of the post-caldera cones, Menshoi Brat, is a large lava dome with flank scoria cones, one of which has produced a series of young lava flows up to 4.5 km long that reached Slavnoe Lake. Eruptions of Kudriavy have been documented since the 18th century, although lava flows from cinder cones on the flanks of Menshoi Brat were also probably erupted within the past few centuries. About KETOI- Geological summary by Smithsonian inst/USGS - global volcanism program:The circular, 10-km-wide Ketoi island, which rises across the 19-km-wide Diana Strait from Simushir Island, hosts of one of the most complex volcanic structures of the Kuril Islands. The rim of a 5-km-wide Pleistocene caldera is exposed only on the NE side. A younger 1172-m-high stratovolcano forming the NW part of the island is cut by a horst-and-graben structure containing two solfatara fields. A 1.5-km-wide freshwater lake fills an explosion crater in the center of the island. Pallas Peak, a large andesitic cone in the NE part of the caldera, is truncated by a 550-m-wide crater containing a brilliantly colored turquoise crater lake. Lava flows from Pallas Peak overtop the caldera rim and descend nearly 5 km to the SE coast. The first historical eruption of Pallas Peak, during 1843-46, was its largest. 2013 AUG- 26 SEP- 04? 2013 JULY- 29 AUG- 20? KIKAI- Geological summary by Smithsonian inst/USGS - global volcanism program:Kikai is a mostly submerged, 19-km-wide caldera near the northern end of the Ryukyu Islands south of Kyushu. Kikai was the source of one of the world's largest Holocene eruptions about 6300 years ago. Rhyolitic pyroclastic flows traveled across the sea for a total distance of 100 km to southern Kyushu, and ashfall reached the northernmost Japanese island of Hokkaido. The eruption devastated southern and central Kyushu, which remained uninhabited for several centuries. Post-caldera eruptions formed Iwo-dake lava dome and Inamura-dake scoria cone, as well as submarine lava domes. 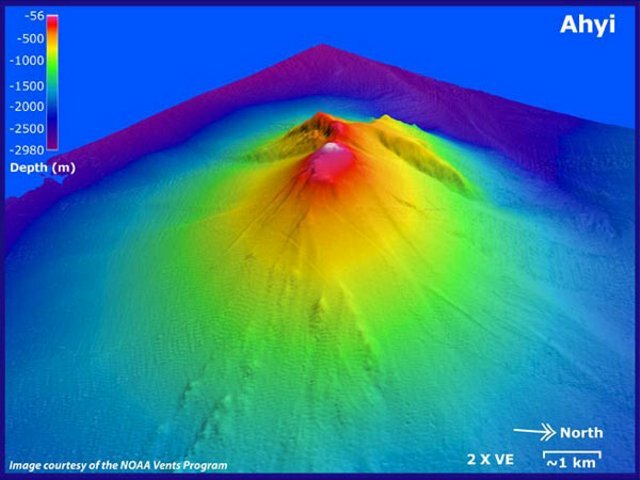 Historical eruptions have occurred in the 20th century at or near Tokara-Iwo-Jima (also known as Satsuma-Iwo-jima), a small 3 x 6 km island forming part of the NW caldera rim. Showa-Iwo-jima lava dome (also known as Iwo-jima-Shinto), a small island 2 km east of Tokara-Iwo-jima, was formed during submarine eruptions in 1934 and 1935. Mild-to-moderate explosive eruptions have occurred during the past few decades from Iwo-dake, a rhyolitic lava dome at the eastern end of Tokara-Iwo-jima. 2013 JUNE- 04 JUNE- 04? ABOUT TORI-SHIMA ( geological summary by USGS- global volcanism program/ Smithsonian institute: The circular, 2.7-km-wide island of Tori-shima in the southern Izu Islands is capped by an unvegetated summit cone formed during an eruption in 1939. Fresh lava flows from this eruption form part of the northern coastline of the basaltic-to-dacitic edifice. The volcano is also referred to as Izu-Tori-shima to distinguish it from the several other Japanese island volcanoes called Tori-shima ("Bird Island"). The main cone is truncated by a 1.5-km-wide caldera that contains two central cones, of which 394-m-high Iwo-yama is the highest. Historical eruptions have also occurred from flank vents near the north coast and offshore submarine vents. A 6-8 km wide submarine caldera lies immediately to the north of Tori-shima. 2013 JULY- 06 JULY- 09? AHYI Geological summary by Smithsonian inst/USGS -Ahyi seamount is a large conical submarine volcano that rises to within 137 m of the sea surface about 18 km SE of the island of Farallon de Pajaros (Uracas) in the northern Marianas. Water discoloration has been observed over the submarine volcano, and in 1979 the crew of a fishing boat felt shocks over the summit area of the seamount followed by upwelling of sulfur-bearing water. On April 24-25, 2001 an explosive submarine eruption was detected seismically from a seismic station on Rangiroa Atoll, Tuamotu Archipelago. The event was well constrained (+/- 15 km) at a location near the southern base of Ahyi; the summit of the seamount lies within the location uncertainty. 23 April-29 April 2014: Seismic stations on Pagan, Sarigan, Anatahan, and Saipan began recording signals starting at 0635 on 24 April believed to be from an undersea volcanic source. Hydroacoustic sensors on Wake Island suggested that the source is at or near Ahyi seamount, although it was possible that the vent is located at one of the other volcanic seamounts in the area. While conducting coral reef research at Farallon de Pajaros, NOAA divers reported hearing loud explosions and feeling the shock waves. One of the more powerful explosions was felt by the crew as it reverberated through the hull of the ship. On 27 April the Color Code was raised from Unassigned to Yellow. A report issued at 0536 on 30 April noted that seismic activity remained high. PAGAN- Geological summary by Smithsonian inst/USGS - global volcanism program: Pagan Island, the largest and one of the most active of the Mariana Islands volcanoes, consists of two stratovolcanoes connected by a narrow isthmus. Both North and South Pagan stratovolcanoes were constructed within calderas, 7 and 4 km in diameter, respectively. 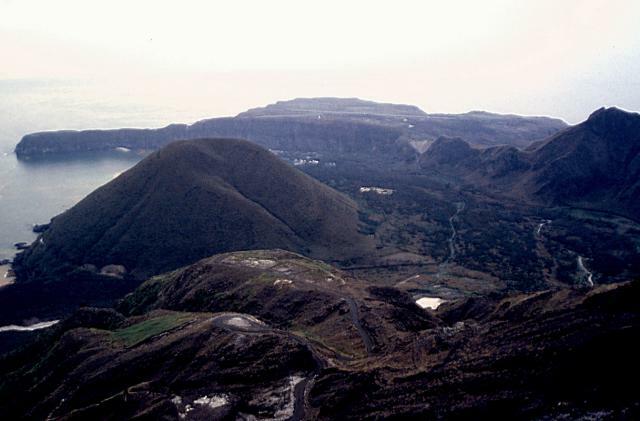 The 570-m-high Mount Pagan at the NE end of the island rises above the flat floor of the caldera, which probably formed during the early Holocene. South Pagan is a 548-m-high stratovolcano with an elongated summit containing four distinct craters. Almost all of the historical eruptions of Pagan, which date back to the 17th century, have originated from North Pagan volcano. The largest eruption of Pagan during historical time took place in 1981 and prompted the evacuation of the sparsely populated island. 2013 AUG- 12 AUG- 20? 2013 JUNE- 15 JUNE- 25? 2013 FEB- 09 FEB- 26? 2012 DEC- 01 DEC 05? 2012 NOV- 17 NOV- 27? 2012 OCT- 12 OCT- 23? 2012 JULY- 10 JULY- 17? 2012 MAY- 07 MAY- 22? 2012 MAR- 30 APRIL ^13? 2012 JAN- 30 JAN- 31? 2011 NOV- 25 DEC- 06? 2011 OCT- 28 Nov- 04? 2011 JULY- 07 JULY- 20? 2011 APRIL- 23 APRIL- 27? about SAKURA JIMA (Global Volcanism Program): Sakurajima, one of Japan's most active volcanoes, is a post-caldera cone of the Aira caldera at the northern half of Kagoshima Bay. Eruption of the voluminous Ito pyroclastic flow accompanied formation of the 17 x 23 km wide Aira caldera about 22,000 years ago. The smaller Wakamiko caldera was formed during the early Holocene in the NE corner of the Aira caldera, along with several post-caldera cones. The construction of Sakurajima began about 13,000 years ago on the southern rim of Aira caldera and built an island that was finally joined to the Osumi Peninsula during the major explosive and effusive eruption of 1914. Activity at the Kita-dake summit cone ended about 4850 years ago, after which eruptions took place at Minami-dake. Frequent historical eruptions, recorded since the 8th century, have deposited ash on Kagoshima, one of Kyushu's largest cities, located across Kagoshima Bay only 8 km from the summit. The largest historical eruption took place during 1471-76. This volcano is situated nearby to the supervolcano caldera of ASO and is currently permanently active with fluctuations. Activity only decreased once in March 2012 and resumed again soon later..
JMA reported that five explosions from Sakura-jima's Showa Crater ejected tephra as far as 800 m during 18-22 November. Incandescence was occasionally detected by a high resolution camera at night. A very small eruption from Minami-dake Crater occurred on 22 November, producing an ash plume that rose 100 m. The Alert Level remained at 3 (on a scale of 1-5). The Tokyo VAAC reported that during 20-21 and 23-26 November, explosions generated plumes that rose to altitudes of 1.2-4.9 km (4,000-16,000 ft) a.s.l. and drifted N, E, and SE. JMA reported that 34 explosions from Sakura-jima's Showa Crater ejected tephra as far as 1,300 m during 26-30 August. Incandescence from the crater was visible at night on 26 August. An explosion on 29 August at 0927 generated an ash plume that rose 3 km and caused ashfall in areas from Miyazaki (80 km NW) to Kagoshima (12 km W). Tephra 1 cm in diameter was confirmed in an area 4 km E. Based on information from JMA, the Tokyo VAAC reported that during 28 August-3 September explosions generated plumes most days that rose to altitudes of 1.5-4 km (5,000-13,000 ft) a.s.l. and drifted E, NE, and NW. 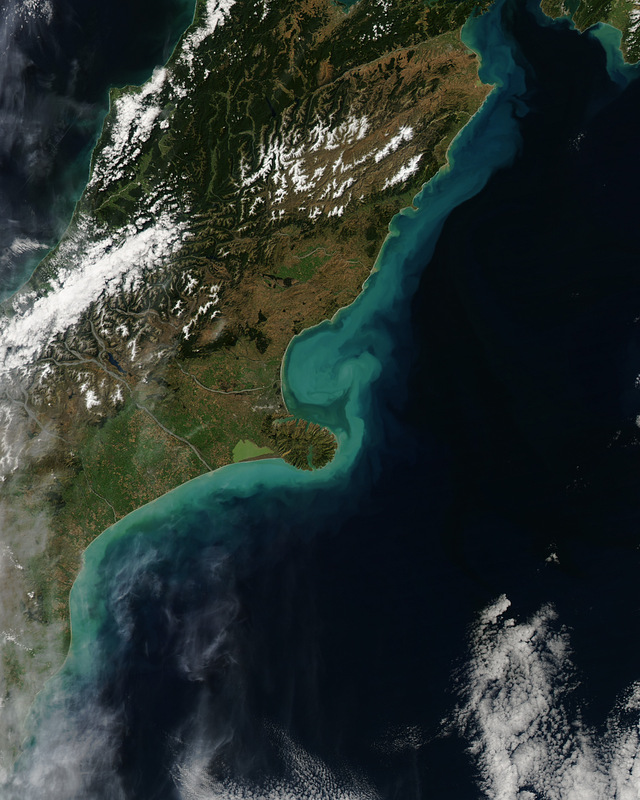 On 31 August a pilot observed an ash plume that rose to an altitude of 2.7 km (9,000 ft) a.s.l. and traveled NE. JMA reported that 24 explosions at Sakura-jima's Showa Crater were detected during 12-19 August and ejected tephra as far as 1.8 km. Incandescence from the crater was observed on 14 August. A very small eruption from Minami-dake Crater occurred on 16 August, producing an ash plume that rose 200 m. An explosion from Showa Crater on 18 August generated a large ash plume that rose 5 km above the crater and drifted NW. A small pyroclastic flow traveled SE. According to news sources, the 50-minute-long eruption produced ashfall in the central and northern parts of Kagoshima (10 km W), causing train delays and poor visibility for car drivers. The event was the 500th explosion this year. ABOUT TIATIA (Geological summary by global volcanism program- USGS/ Smithsonian institute): Geologic Summary. Tiatia volcano, one of the most impressive of the Kuril Islands, consists of a beautifully symmetrical cone that rises above the broad rim of an erosionally furrowed, 2.1 x 2.4 km wide caldera. The 1819-m-high Tiatia (also known as Chacha-dake) occupies the NE tip of Kunashir Island and morphologically resembles Mount Vesuvius. The pristine-looking conical central cone, mostly formed by basaltic to basaltic-andesite strombolian eruptions, rises 400 m above the floor of the caldera and contains a 400 x 250 m wide crater with two explosion vents separated by a linear septum. Fresh lava flows cover much of the SW caldera floor and have overflowed the rim, extending to the foot of the older somma, which formed during the late Pleistocene or early Holocene. A lava flow from a flank cone on the northern caldera rim reached the Sea of Okhotsk. A major explosive eruption in 1973 was the first since Tiatia's initial historical eruption in 1812. 2012 SEP- 01 SEP/ 04?